Adae To Remember: LAZADA : Super Brands for Super Deals! Attention all shoppers! 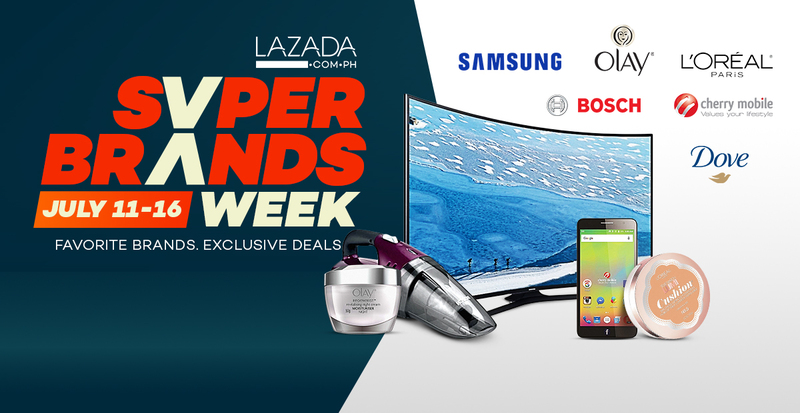 From July 11-16, Lazada will be celebrating its Super Brands Week. That means you can get your favorite local and international super brands for super deal prices! Enjoy up to 80% off on best-selling names such as Olay, Maybelline, L’Oreal, Samsung, Canon, Imarflex, Bosch, and MamyPoko. Browse through the selection of newly onboarded brands, such as Fila, Speedo, Pedigree and Purina, EQ, Canadian, NYX, and Ever Bilena. And stay logged onto the Lazada site for some special promos, flash deals, and raffle prizes to be won throughout the 6-day event! Get a whole new wardrobe with some storewide sales for the following Lazada fashion brands: Sebago, Bobson, and Wrangler, all at up to 30% off. Freego at up to 50% off, and Peneshoppe at up to 55% off! For those with a knack for tinkering in the kitchen, there’s the Pyrex 8” easy grab baking dish for only Php 599.00. Pair this up with the Imarflex over toaster for only Php 700.00 and you’re sure to cook up a storm! Travel in style with Delsey! Get an iconic Helium Hard Case luggage trolley for only Php 7,250.00 – up to 55% off from the standard retail price. For short-term business trips, keep your laptop safe and sound in a Delsey Spacieux Laptop Backpack for only Php 2,400.00. For new parents, get a classic Fisher-Price rocker for only Php 1,709, up to 57% lower than standard retail price. And don’t forget to stock up on your Huggies Dry Pants diaper supply, with prices as low as Php 576 for 60 pieces. Last but not least, stay tuned to Lazada’s Facebook page at 12 noon from July 11-16. At noontime throughout all days of Super Brands Week, Lazada’s Facebook Live sessions will bring you celebrity guests, mystery Lazada boxes up for grabs, and special games to be played with Lazada Facebook fans. Follow Lazada Philippines on Facebook to get the latest updates. See you at Super Brands Week! Lazada is the number one online shopping & selling destination in Southeast Asia – present in Indonesia, Malaysia, the Philippines, Singapore, Thailand and Vietnam. Lazada helps more than 80,000 local and international sellers as well as 2,500 brands serve the 560 million consumers in the region through its marketplace platform, supported by a wide range of tailored marketing, data, and service solutions. Lazada offers an excellent customer experience through a wide network of logistics partners and its own first- and last-mile delivery arm.